Many times at coffee shops it is difficult to see behind the counter, to see what the barista is really doing. The grinding, banging, pounding, clanking, humming, gurgling, and whistling makes everyone wonder, what is going on back there? While I am making drinks there are usually people peeking around, intently watching with a puzzled stare. So let me show you what is going on, and the next time you are at a coffee shop with a friend, maybe one wondering about all of that noise, you can easily tell them all about it! The first noise in the process is of grinding the beans. For espresso the grounds need to be very fine, which requires a burr grinder to obtain the correct size and consistency. A burr grinder crushes the beans between two cast metal plates that are set at a certain distance apart, so only once the grounds reach the appropriate size will they be able to fall out of the side of the burrs. After the beans are ground, approximately 14 to 21 grams are measured into the portafilter and then pressed down with a tamper. This is where it seems every barista has his or her own style. 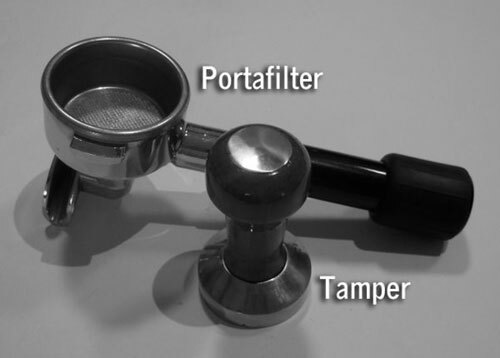 It starts with a snap, snap, snap sound as the grounds are transferred from the grinder into the portafilter. Then there might be a thud if they bang the portafilter on the counter to settle the grounds, maybe another snap if they add more coffee, a whack if they tap the side of the portafilter with the tamper, and then the quiet part of pressing the grounds down. Because an espresso machine brews under 8-10 bars of pressure, the grounds need to be pressed down with about 30 pounds of pressure so that the water goes through the grounds evenly for the best extraction. Depending on the barista, you might hear some grunting as they muster up the strength for the 30 to 40 pounds of pressure. Next there might be some clanking as the portafilter is locked into place under the brew group head. This is where the water from the brewing boiler goes through a few screens to disperse it and then goes into and through the grounds in the portafilter. The espresso then flows out of the bottom, divided into two streams, into the cups. If this is for a hot drink, the noise is not over yet. 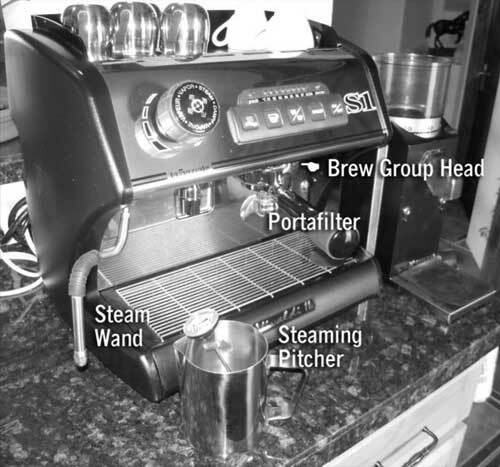 For a latte, breve, cappuccino, or similar drink the next part is to steam, or froth, the milk with the steam wand. After the milk or half-and-half is poured into the stainless steaming pitcher and set aside, the steam wand is wiped down with a damp rag and then turned on briefly until the water is flushed out. This is where the hissing and whistling begins. The steam wand is submerged in the milk and then the steam is turned on; there might be some gurgling noises too as air is incorporated into the milk. As it swirls around and heats up the steam wand might whistle at a higher pitch until it is finally turned off. The milk is gently poured into the espresso and the drink is finished.